DUG Insight User ManualFrequently Asked QuestionsFrequently Asked Questions WorkflowsHow do I make an isopach or isochron map in Insight? 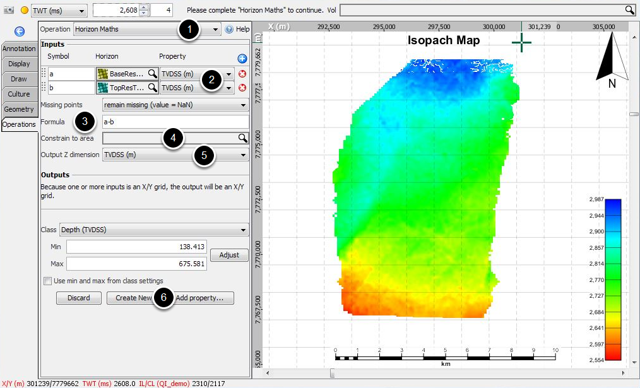 A simple horizon maths operation can be used to create an isopach or isochron map in Insight. Both maps are created in a similar way. Open Map View and begin a Horizon Maths operation (see Horizon Maths). At the Inputs section, input horizon 'a' and 'b', and set their property as TVDSS (m). At Formula, insert the formula: a–b. You can optionally constrain your isopach map by selecting a polygon at Constrain to area. Select TVDSS as the Output Z-dimension. Note: If you do not want the isopach map to show on the seismic, set the Output Z dimension to <none>. Without the Z dimension, you will only be able to view it from Map View. The newly created isopach map can be saved as a separate horizon or as a property of an existing horizon. At the Inputs section, input horizon 'a' and 'b', and set their property as TWT (ms). You can constrain your isochron map by selecting a polygon at Constrain to area. Select TWT as the Output Z-dimension. Note: If you do not want the isochron map to show on the seismic, set the Output Z dimension to <none>. Without the Z dimension, you will only be able to view it from Map View. 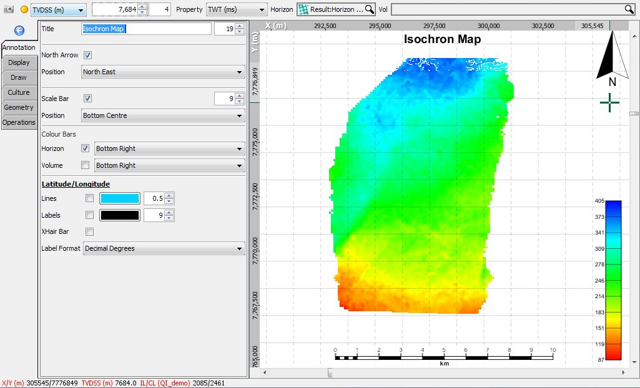 The newly created isochron map can be saved as a separate horizon or as a property of an existing horizon. Prev: How to interpolate RMS values on a 2D horizon? Next: How can I update a horizon to tie markers at wells?